The Colorado teacher, Kyle Schwartz, asked the eight and nine-year-olds to write down something they wished she knew about them. The goal of the assignment was two-fold: a literacy exercise for the students and a way for her to get to know them better. 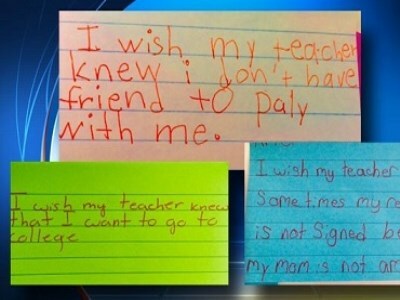 A few weeks ago, Schwartz began posting the students’ notes on Twitter under the hashtag “IWishMyTeacherKnew”. Some of the responses included “I don’t have pencils to do my homework” and "I want to go to college". One girl wrote that she had no friends to play with at recess. Schwartz called the note "heartbreaking", but said she was glad to see how the other students rallied to support the child who wrote it. According to Schwartz, the next day at recess, the girl’s fellow students huddled around her and played tag. According to Schwartz, the academic and emotional needs of students go hand-in-hand, and deserve equal attention. "A lot of what we're teaching is how to be a good friend. My students' emotional needs are just as important as their academic needs," Schwartz said, adding that it also helped underline the issue of poverty in US inner cities. Schwartz told ABC News that the project was a “reality check”. While it is understandable that students might not want to make their respective plights known, in the case of Schwartz’s Denver inner city school, the students did not mind adding their names to their notes, despite being given the option of anonymity. So what benefits might a project like this provide Australian schools? As students in low-SES schools here share similar disadvantages as the ones mentioned above. They are also likely to have a similar desire to share the thoughts and feelings associated with those disadvantages with their teachers.